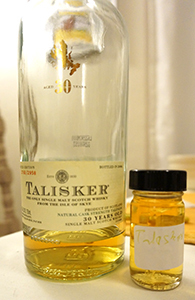 Both these Talisker 30 samples came from the same gathering as the Clynelish 17, Manager’s Dram and the Supernova 2014. (There are samples of some other monsters brought home as well from that evening that will be showing up here in the next few months.) These were my first tastes of Talisker 30 (I’ve had a bunch of the 25s and also the 35) and I’ve been looking forward to spending a little more time and concentration on them. The Talisker 30, like the 25 yo, is no longer at cask strength—the 2010 edition was the last at cask strength (I have a bottle in the stash but who knows when I’ll ever open it). Our impression at the tasting was that the 2012 just didn’t have the depth of the 2006 (which was also my finding re the 2012 edition of the 25 yo vis a vis the CS 25s). 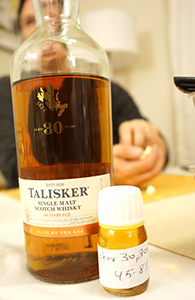 It is also true that on that night we’d been drinking a lot of fairly high-powered whiskies before we got to the Talisker 30, 2012; so it’s possible it may have suffered for that reason. Well, let’s see what I make of the juxtaposition tonight. I’ll start with the lower abv. Nose: Toffee, mild caramel and soft, minerally peat. Fruit right below—orange peel and apricot, a bit of plum too—and also notes of milky coffee. With more time there’s a hint of the famous Talisker pepper. Some sweeter, almost berry-like notes after a bit along with some vanilla. With more time there’s a bit of butterscotch. All the notes are really nicely integrated throughout. Water mutes the fruit. Palate: Peppery from the get-go with the prickly peat right behind. Not as much of the fruit or the softer, sweeter notes on the nose. On the second sip it’s peatier still and now there’s quite a lot of salt behind it. Even more peat with a drop of water and now there’s some olive oil and a touch of sweetness (wet stones). Finish: Long. Increasingly briny with the peppery peat going for a long time without expanding. As on the palate with water. Comments: I liked the 2012 a lot more tonight than I did at the tasting in September. As to whether that’s because I had more of it tonight (we only do very small pours at these tastings with large lineups, so as to not get blotto) or because it had come after too many CS whiskies that night, I’m not sure. I can say though that even at 45.8% this is a very good whisky, but it doesn’t come across as particularly old (and it’s quite feisty despite age and dilution). The nose is the most complex, the palate and finish more straightforward. It has no flaws whatsoever though. Nose: Much tighter at first (even though the abv isn’t that high). As it begins to open there’s far less peat than in the 2012 and less pepper too. Instead the strongest impression is of brine and a mild creaminess. With more time here’s some peat with notes of leather and wet sackcloth. Green olives and oyster liquor as well, but none of the fruit of the 2012 (I wonder if diluting down to 45.8% will bring them out). Gets brinier with a hint of almond oil in there as well. With a few drops of water there’s more cream and a bit of milk chocolate, but no, no fruit. Oh wait, I might be making it up but I’m getting some dried orange peel now. Palate: A prickly, peppery arrival as with the 2012 and quite peaty too. A big wave of salt and sweeter coastal notes (kelp, seashells) right behind the pepper and peat. On subsequent sips there’s a bit of that leatheriness I got on the nose and then out of the blue some lime. Gets peatier and more peppery as it sits but there’s more minerally sweetness too. Okay, let’s see if water brings out anything new. More citrus with water (orange now) and the peat backs off a little and the salt backs off a lot. Finish: Long. Nothing new here but the salt expands as it slowly washes out. As on the palate with water with some bitterness developing late (not unpleasant though). Comments: As with the 2012 this is very Talisker. It’s also more austere than the 2012. I still like it more than the later bottling but only a little more tonight and not enough to push it into the 90s. As you can see from the picture, this was from the very end of the bottle’s life; perhaps it would have been a different story/score at a different point in its life. Thanks to Jim for both samples! This entry was posted in -Whisky by Rating, 85-89 points, Distillery, Talisker and tagged *Whisky, Peated, Scotch, Single Malt, Skye, Talisker. Bookmark the permalink.